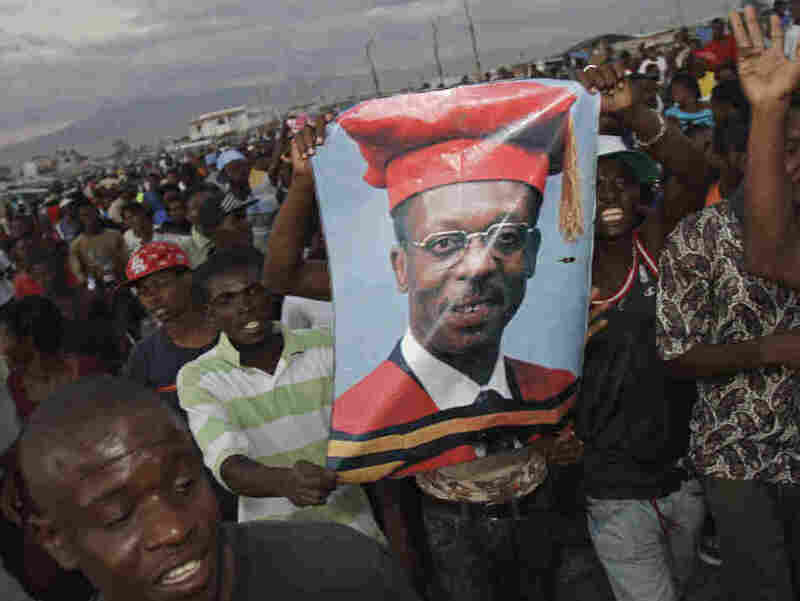 Supporters of Haiti's ousted President Jean-Bertrand Aristide hold up a poster of the exiled leader in Port-au-Prince, Haiti, Thursday March 17, 2011. Haiti's former president, Jean-Bertrand Aristide, toppled twice by armed coups, has flown into Port-au-Prince, according to Reuters. He'd been living in South Africa. As the Miami Herald reports, the Obama Administration didn't want him to return, ahead of Haiti's national election Sunday, fearing his arrival could destabilize the vote. The Financial Times notes the two Haitian presidential candidates accepted his return but had asked him to wait until the vote was over. Some here question whether Haiti can afford the risk. Since Aristide's Feb. 29, 2004 ouster amid a bloody rebellion, the country has struggled with armed kidnappings, deadly hurricanes, food riots and the hemisphere's worst natural disaster — a 7.0-magnitude earthquake that left 300,000 dead, an equal number injured and one million-plus living in tents.